Kevin Scott, a farmer in South Dakota and a member of the board of directors of the American Soybean Association, explains that Trump's threat to walk away from NAFTA created uncertainty that lasted months for farmers. His group was not opposed to updating NAFTA. "There were some things that needed to be modernized. And we we don't dispute that," he says. "We were pretty concerned, though, when it was pulled off the table," Scott said. He's talking about when the president threatened to withdraw from the deal. "Benefits sneak up on you: trade develops slowly over time, these things get opened up," he says. "And then when they shut off, then you know what you've what you've lost." Mexico is one of the top three export markets for U.S. soybeans. 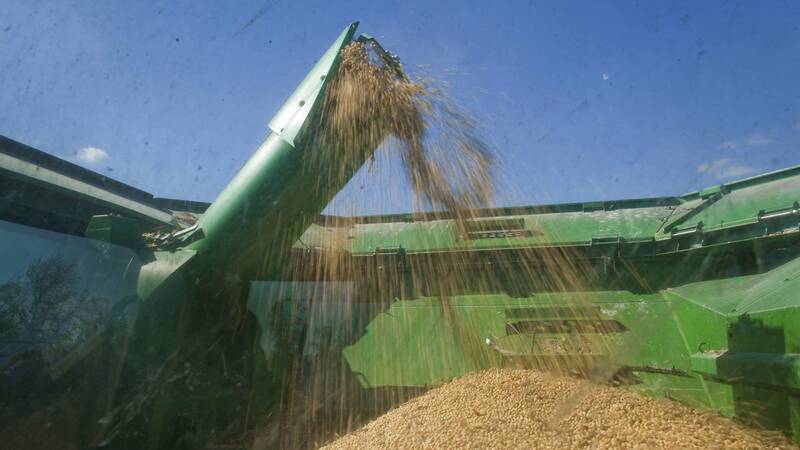 Soybean farmers were already left reeling by the massive tariffs imposed by China — part of the ongoing trade war triggered by the Trump administration. Losing open access to the Mexican market would have been another blow, Scott says. "In farm country, we're used to dealing with some of that stuff," he says. "We just don't like it." So he welcomed the replacement deal — not because of any particular new benefits for soybean farmers, but because it preserved the market access established under NAFTA. Doyle Lentz, a farmer in North Dakota whose crops include wheat and barley, talked about similar concerns, even though he does see a particular benefit for wheat farmers in the new deal. American farmers had been frustrated by Canada's policy of classifying all U.S. wheat as low-quality (and therefore low-price). The new deal prohibits that low-quality classification, essentially allowing U.S. farmers to sell more wheat to Canada at fairer prices. That's good news, Lentz says. But threatening to tear the deal up in order to improve it was "not worth the risk," he believes. "I don't think there was any need to open NAFTA from an agriculture standpoint," he says. "Most of these things could have been remedied by just having an open communication and dialogue ... I guess I'm more of the belief that's how you do negotiations and trade than, you know, hold a gun to somebody's head." It's not just farmers who are more relieved than rejoicing. Robert Gruschow is the president of Deshler Group, headquartered in Livonia, Mich. The company offers services primarily to the auto industry — manufacturing and assembly but also IT, shipping, warehousing and supply chain management. The renegotiation of NAFTA was "a nervous time period for us," Gruschow says. Deshler Group was already in the middle of an expansion when the renegotiation began — throwing into question whether they'd actually need all that extra capacity. Other suppliers in the auto industry opted out of expansions and improvements, waiting to see the outcome of NAFTA talks, Gruschow says. "During this time period, the auto industry has ... kind of hit the hold button," Gruschow says. Now there's "more predictability," making it easier to plan for the future. "Whatever the deal — whether it's a net beneficial or not to the auto industry — I think knowing and understanding what's coming is a relief," he says. Analysts and former policymakers echoed a similar note of relief. The "best thing that can be said about the new agreement" is that it might bring certainty, says Michael Camuñez, the president and CEO of Monarch Global Strategies and a former assistant secretary of commerce under President Obama. Camuñez notes the uncertainty, itself, was "totally self-inflicted." "I don't want to sound like a naysayer," he says. "I'm very happy that this agreement has been reached. I hope it will bring more stability and certainty than we've had for ... the last 16 months." Veronique de Rugy, a senior research fellow at the conservative Mercatus Center at George Mason University, says the new deal includes a number of positive changes — like addressing e-commerce — as well as changes that might hike the price of cars, which would hurt consumers. But she, too, emphasized that any deal is better than no deal. Walking away from NAFTA "would have been really tragic," she says. She points to the positive response of the stock market after a deal was announced — even before any details were revealed. "The market doesn't like uncertainty. It creates paralysis," de Rugy says. "It stops investors from investing and pursuing their plan to invest in the U.S.
"You lift that uncertainty, and it's a very positive thing," she says. Of course, not all the uncertainty is lifted for farmers and manufacturers. Steel and aluminum tariffs remain in place, as does the massive trade war with China. And the new trade deal, the USMCA, still needs to be approved by Congress.